When you just can’t fall asleep, it’s easy to think you’d give anything to finally doze off. Would you never watch Netflix again? Give up pizza? What about switch your political affiliation? 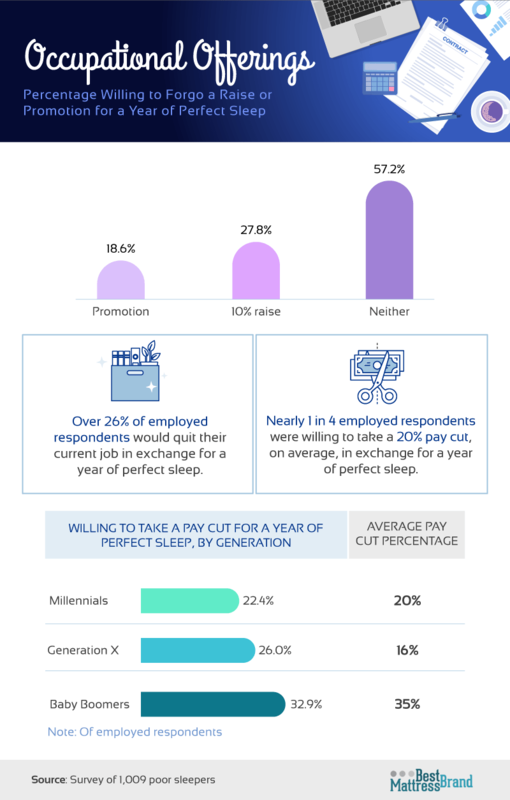 We surveyed 1,009 self-described “poor sleepers” across the country to find out just how much they’d be willing to give up to sleep perfectly for an entire year. Sleep-related problems affect as many as 70 million Americans, and an estimated 25 percent of adults report poor sleep health. On average, the respondents studied (all of whom described their typical sleep quality as “poor”) reported experiencing problems with their sleep five nights a week. Maybe it’s because everything from heart disease to anxiety disorders are being scientifically linked to poor sleep, or it’s the sheer frustration caused by lying awake at night, but the dream of a year of perfect sleep left respondents considering major sacrifices. As it turns out, bad sleep quality led Americans to consider giving up a lot. Everything from quitting social media to seeing their family members less often was mentioned. Read on to see the small and large sacrifices people were willing to make to experience a year of blissful sleep. Nearly 70 percent of respondents would give up all food delivery for a year in exchange for a year of perfect sleep. Another 68 percent would let go of ride-sharing services. 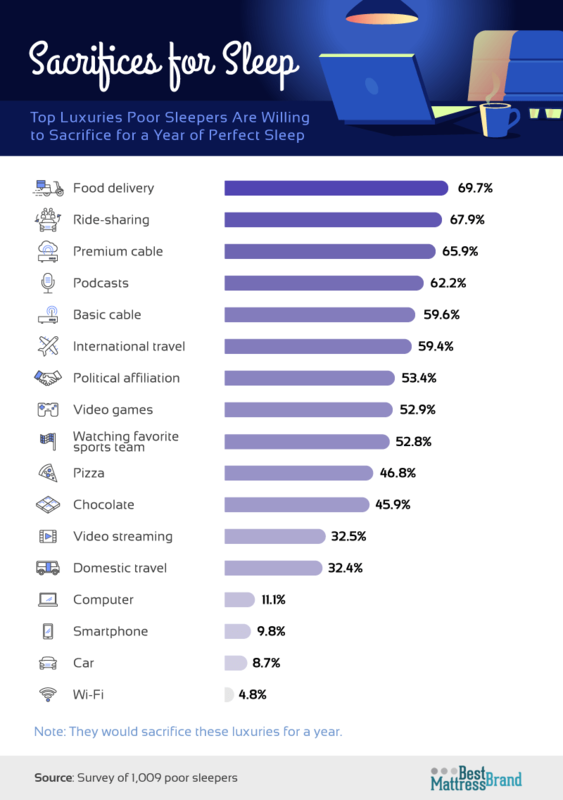 Although cooking for and driving yourself are mostly matters of convenience, over 59 percent of respondents would sacrifice international travel for a year’s worth of perfect sleep. Even nearly 53 percent of those who had a favorite sports team would be willing to go game-free for the whole year. The hardest thing to let go of was Wi-Fi, which less than 5 percent of our respondents were willing to do to sleep well for a year. Perhaps any number willing to make this sacrifice is significant, as forgoing Wi-Fi could mean anything from being unable to earn an income to losing touch with loved ones. Two crowd favorites – pizza and chocolate – were theoretically sacrificed for a year of perfect sleep 47 and 46 percent of the time, respectively. Video streaming services like Netflix and Hulu were grasped a little more tightly, as only 32.5 percent of our respondents were willing to let go of this habit. Not everything was equivalently sacrificed across genders and generations. Although men and women were equally as likely to give up their political affiliations and basic cable for a year of perfect sleep, only 41 percent of men would consider giving up video games, while nearly 61 percent of women were willing to quit playing them. Basic cable appeared too popular among baby boomers to sacrifice – less than 43 percent of poor sleepers in this generation would exchange it for a year’s worth of perfect sleep. Millennials and Gen Xers more easily let basic cable go, most likely because these demographics favor online video streaming services to cable: 61 percent of young adults prefer primarily to watch TV through video streaming services like Netflix and Hulu. At the thought of a year’s worth of perfect sleep, only 30.4 percent of millennials were willing to stop streaming videos online. The generational difference extended to the attachment to cars: 10.1 percent of millennials would give up their cars for a year of perfect sleep, yet only 5.7 percent of baby boomers were willing to do the same. Transport, also differs generationally, as 16- to 34-year-olds are the most enthusiastic adopters of ride-sharing services like Uber and Lyft. With this in mind, the sacrifice of a car may have appeared smaller to millennials than their older counterparts. That said, fewer than 8 percent of all generations and genders were willing to forgo Wi-Fi to secure better sleep. The concept of more sentimental sacrifices for better sleep also revealed differences among genders. When asked how many consecutive days respondents would consider going without seeing their spouses, responses averaged 23 days. 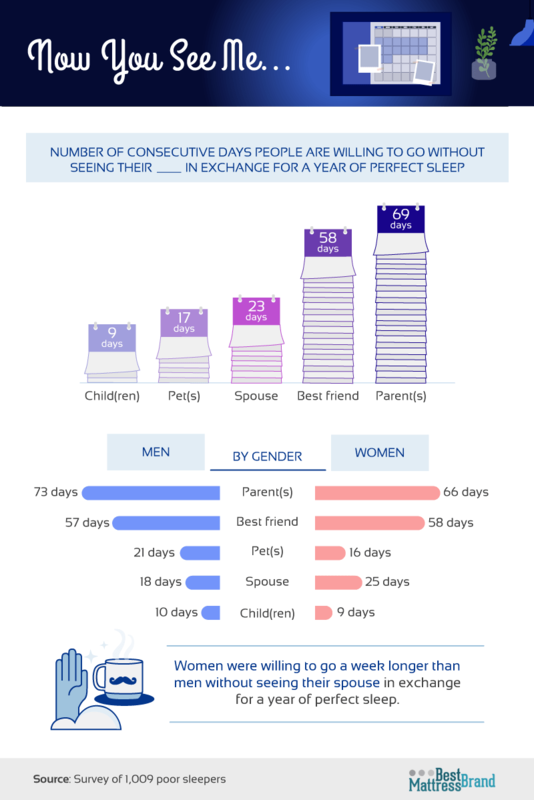 That said, women were willing to go an average of a week longer than men without seeing their spouse to experience a year of perfect sleep. The loved ones who could be absent the most? Parents. On average, participants were willing to stop seeing their parents for 69 consecutive days for a year of perfect sleep. In comparison, they’d only be willing to go 58 average days without seeing their best friends. Children were held to most tightly, as parents could only imagine going an average of nine days without seeing their kids, even when offered a hypothetical year of completely perfect sleep. Sacrificing social media for sleep turned out to be an ironic sacrifice, as these apps were often what kept our participants awake in the first place. 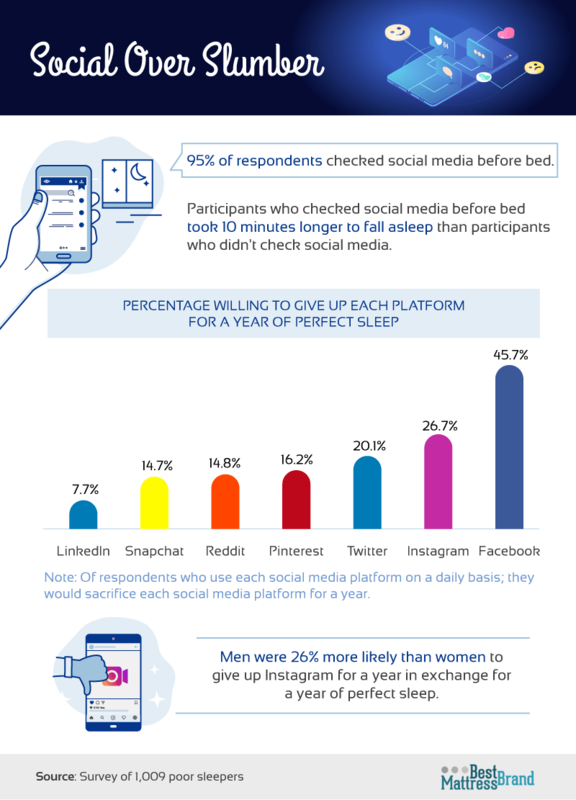 A whopping 95 percent of respondents admitted to checking their social accounts right before bed. On average, they took 10 minutes longer to fall asleep every night. Every week, this would add up to over an hour of sleep sacrificed to be on social media. When it came to specific sites, Americans were most willing to give up Facebook in exchange for great sleep – nearly 46 percent of respondents willing to give it up. Next came Instagram, with which less than 27 percent of respondents were willing to part. That said, men were 26 percent more likely than women to delete Instagram for better sleep. LinkedIn, the most career-oriented social site of the studied mix, was only willing to be parted with by 7.7 percent of its user base. Perhaps respondents considered lost networking opportunities more significant than their typical Facebook, Instagram, and Twitter feeds. Half of all working professionals lose sleep over work. Depending on your perception of American work culture, it may come as no surprise that 57 percent of respondents were not willing to give up raises and promotions for better sleep. That said, roughly a quarter of respondents said they would quit their current jobs for a year of perfect sleep. Older respondents were more willing to accept a pay cut to sleep well. Thirty-three percent of baby boomers would have taken an average pay cut of 35 percent in their annual salaries to get a year of perfect sleep. Millennials, on the other hand, would only agree to a 20 percent pay cut, on average. Sleep and work tangled in another interesting way among respondents: 40 percent had admitted to falsely calling in sick for work in the specific hopes of getting more sleep. Nearly any way you slice it, sleep is incredibly important. So important, in fact, that many people currently lacking sleep are willing to consider time away from their loved ones and pay cuts to experience a year of perfect sleep. It’s no exaggeration to say that sleeping well can improve your life in so many ways, whether professionally or emotionally. While you may not be able to ever truly trade material or sentimental items for a year of perfect sleep, there are more tried-and-true steps you can take right away. It all starts with a great mattress and a place for your sleepy self to call home. At Best Mattress Brand, you can get the latest information to help you make the best mattress decision. Fortunately, there’s no real-world need to give up Wi-Fi or time with your loved ones to begin your journey to a better year of sleep. For this analysis, we administered online surveys to 1,009 people in America with poor sleep quality using Amazon’s virtual crowdsourcing marketplace, Amazon Mechanical Turk. We used screener questions to only poll respondents with poor sleep quality. Any participant who rated their sleep quality as “good” or “very good” was ejected from the questionnaire. On average, participants received 5.8 hours of sleep per night and cited experiencing sleep-related problems at least five nights a week. To keep titles succinct, we defined “perfect sleep” as receiving eight or more hours of restful sleep a night. Participants ranged in age from 18 to 83 with a mean of 36 and a standard deviation of 11.6. Of the 1,009 people surveyed, 59.4 percent identified as millennials, 26.6 percent were a part of Generation X, and 10.5 percent were baby boomers. The other 3.6 percent of participants belonged either to Generation Z or the silent generation. Generations that failed to meet a minimum sample size of 26 were excluded from the age-related breakdowns. Additionally, 59.8 percent of respondents identified as female, and 40.2 percent were male. Participants who failed to answer an attention-check question correctly were disqualified from the survey. Participants were only allowed to give up a luxury, routine, social relationship, social media, or work-related scenario if each topic was relevant to them. For example, respondents must have performed an evening or morning routine daily to say they would give it up in exchange for perfect sleep quality. Answer options may have been relabeled for clarity. The main limitation of this study is that the data and claims made rely on self-reporting. There’s a long list of issues with self-reported survey data, which may include but are not limited to the following: attribution, exaggeration, and selective memory. Further, we did not have a validated measure of sleep quality, so we created our own. Participants rated their usual sleep quality on a 4-point scale (with 1 as very poor and 4 as very good). Sleepless nights are frustrating enough, but restless Americans are not alone. Feel free to share this article online for noncommercial purposes with anyone who may be struggling to sleep; just make sure to link back to this page and its authors so that they receive proper credit.